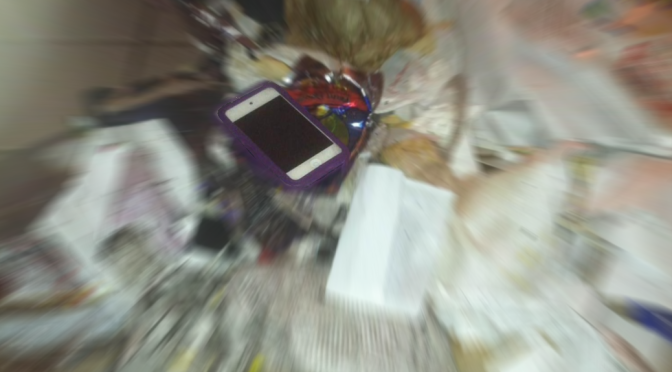 My eleven-year-old daughter misplaced her beloved iPod today. After FaceTiming with her friends, she had some ice cream and then lost track of it. We searched the house in all the places she remembered she’d been to but no luck. Stump city! She even claimed that she had a blackout from some point on and couldn’t remember what happened. Unbelievable! After much crying and consternation my daughter reluctantly went to bed but I was still going crazy trying to figure out where the heck the darn iPod had disappeared to. As a last ditch effort I tried the find app one more time and miraculously it shows the device’s location from an hour ago. IT’S STILL IN THE HOUSE! I grab a flashlight and my iPad and start searching every nook and cranny. Not sure if I’m on a wild goose chase or what but I’m determined to find the iPod even if I have to stay up all night. It’s a point of pride now. I send the command from the “Find My iPod” app to make a sound and BINGO, a low, muffled ping! I check the living room but the sound grows faint. I head back towards the kitchen, and yes I hear it, it is here somewhere. Yep, you guessed it. The freakin’ iPod was buried at the very bottom of our trash can, under the dinner scraps, coffee grounds and the rest of the trash. Nice. I really should make my forgetful daughter clean up the mess I had to make retrieving it but the thought of how happy she’d be in the morning made it all worthwhile. Daddy Detective saves the day! …for like, the millionth time.